Water is found in abundance around us, but not all of it is actually safe to consume. With diseases like malaria taking the center stage when it comes to water, we need to spend more time and effort to ensure the water that we do decide to drink is actually safe and won’t cause any real harm to us or our bodies. 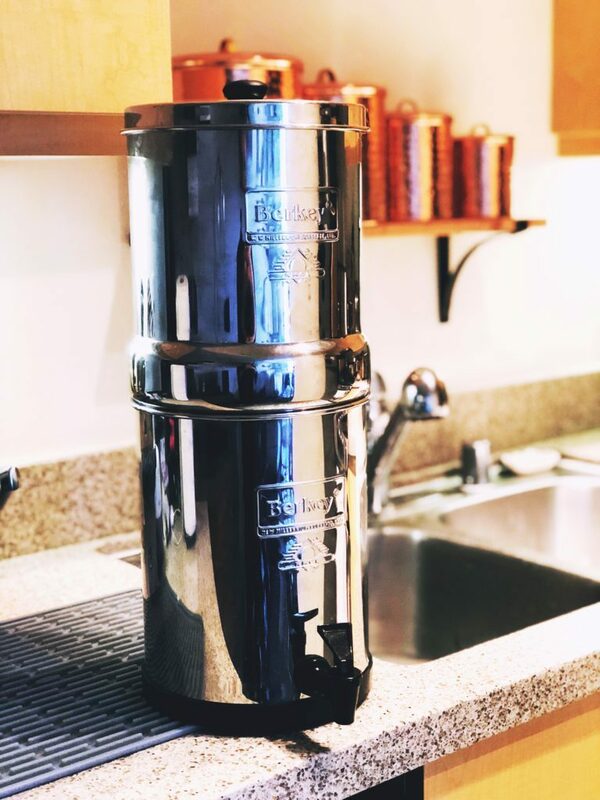 Berkey has designed the Big Berkey Water Filter that everyone is going on about. It is not one of the common water filters that we commonly look at, but since it does have such a massive following, we have decided to give it a try. We have tried many different filters to help find the top ones and used that information in this review. Let’s not waste time and dive directly into the review on this water filter. It is a countertop water filter, making it one of the easier options to move around. Since it can be placed on your counter, you might need to find some space for it, but once found, it can simply be left untouched and used to start drinking water. The unit itself has been constructed from stainless steel and this does make it a little heavier than many people would like. However, all the parts are received as we have wanted them to be, and the assembly did not take much more than 30-minutes. You won’t need any specialized skills if you want to start assembling this water filter. While the unit itself does come with filters that can be used, the part that we had a few issues with was actually setting up the filters and replacing them. This should not be much of an issue and the filters can easily be replaced by actually following all of the instructions that have been given. One of the best parts is that you actually receive PF-2 fluoride and arsenic filters that can be used optionally if needed. The unit itself can actually clean really effectively. While we did not only use the test from the manufacturers, independent tests that have revealed it still removes about 95% of heavy metals, with lead being one of the most important. It removes mercury with ease and you won’t need to worry about this in your water. Looking at Chlorine, we have found that the detection levels of Chlorine in the filtered water is extremely low and it can be near impossible to actually detect the Chlorine in your water. We believe this unit will, in fact, remove almost all of the Chlorine. However, the Ceramic levels that are cleaned will only be a little over 90%. Another massive plus is that this unit does not really need a lot of maintenance. Yes, you need to occasionally do some cleaning of it to ensure that everything is still fine and working, as they should inside, but not much else. Disassembling the top part did not take much time either for a simple and easy wash. The filters themselves can be a little expensive if you want to buy them. However, the included filters should last you around 3-years before they actually need to be replaced. This will save you a lot of money in the long run. Another major factor that has been mentioned by the manufacturer is that the filters should have a lifespan of around 1,000-gallons. While the filter itself has not been designed for one specific market, it can be used by almost anyone looking to keep their water clean and filtered. The price can be a little steep if you don’t really use filtered water that often, but we need to look at the health as well. Drinking cleaner water can actually help you save on medical costs. We would recommend it to families of average size to ensure that the water filter does work as much as it should. It should not simply be standing full of water as this could have a bad effect and still, water has never really been great for anyone. It is a breeding place for bacteria’s and diseases. As the saying goes, you should not really believe everything you read on the internet and this is the case with this filter. Many claims have been made, with only a few backed up. Don’t get me wrong, it is still something that I would like to have in my home for clean water, but it won’t surpass all the other filters on the market today. Let us know what you think of this filter and if it has worked for you as effectively as it has worked for us. We would like to read any of the comments and if you have had any specific troubles when using it. Amanda is the founder of Consumers Base and many other authority websites. She loves to explore new things. She has excellent literal ability and an eye for the finer details in life which makes her content amazing.